Idlis, yes, we all love Idlis and different types of Idli recipes from Rice and Moong Dal idli to Spicy Tava Idlis. 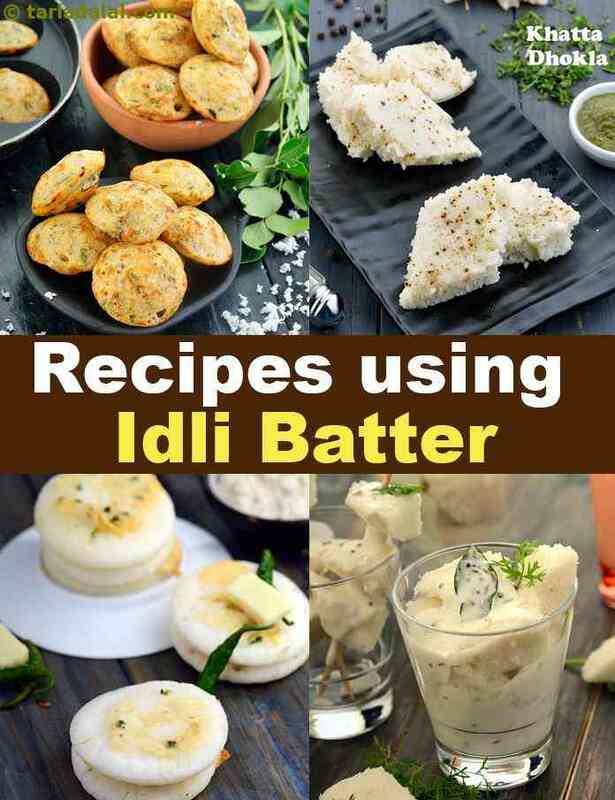 We are excited to share with you recipes using Idli batter. For South Indians, breakfast is comprises mainly of dosas and idlis and they make enough batter which they can roll on for a few days. Hence we show you Idli batter recipes or recipes with leftover idli batter. Uttapam is a great breakfast snack to have and made Mini Cheese Uttapa using Idli batter this time. For Kids, make the Mini Idlis in coconut sauce and serve it with some awesome sambar and chutney. Here is an innovative twist for kids with Sweet Idli. Perfect Idlis are a matter of pride and this requires you know what! Perfect IDLI BATTER. Fluffy as cotton balls, every South Indian mom said to convince their kids to eat breakfast. Grinding of batter and preparation if Idli is almost a daily affair in South Indian homes and follow our Idli recipe to know how. Who would think of Sushi recipes with leftover Idli batter. We have Dhokla Sushi with Carrots and Dhokla Sushi with Bell Peppers. Gujarati Food is also influenced with recipes with Idli batter. Your Khatta Dhokla and Vegetable Handvo got quicker to make thanks to Idli batter. Don't forget to make the Quick Vegetable Appe and Masala Appe made from Idli batter. All you need to do is perk up your left over Idli batter with household ingredients like onions, green chillis and ginger. This easy handva can be served in just a few minutes. While the bottle gourd and curds, add health and taste to convenience. Try out this innovative recipe to enhance your tastebuds for the forth coming winter. Hariyali Munchies are full of goodness. They can be packed in tiffin without any chutney as the munchies are packed with an array of flavours. Beside it is easy for children to eat,they can just pick and eat. There will be a repeated demand of `Hariyali Munchies` from the children. A very tasty tiffin treat for tiny tots.